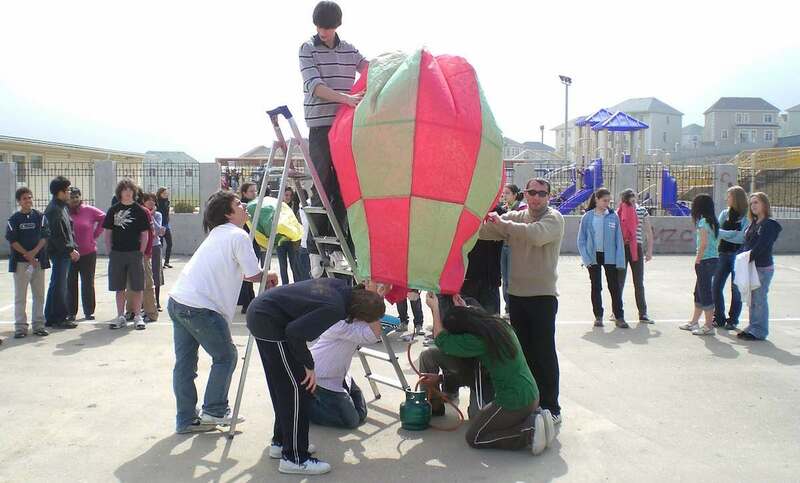 This hot-air balloon activity, I started as a teacher at Bishop Mackenzie International School (BMIS) in the small but beautiful country of Malawi, in Southern Africa. I was introduced to it by my good mate and colleague James. Turned out, some school resource supplier in the UK sold paper hot-air-balloon kits! At BMIS, every year, the whole of Form 3 (Grade 8 in the American system) assembled one balloon using a kit. But in Baku, Azerbaijan, I modified the activity considerably, making it a lot more involved and challenging. To begin with, I set out the task/activity as a preparation for a hot air balloon competition (see instruction/information sheet below). Incidentally, the grading criteria which accompanies the sheet is a modified version of the IB Middle Years Program (MYP) science grading criteria from the academic year 2007-08. If you read the sheet, you may have noticed that preparing for the “competition” involved working in small groups, each group deciding on a “race” to participate in, analysing the available “fuels” in the lab, deciding on an appropriate fuel and then making their own balloon from scratch, a little different from how we did it in BMIS. The topic we covered while engaged in this activity/project was Fuels and Energy. Of course, there’s more to the activity — and therefore more support materials — and they’ll all be coming soon! Be sure to keep an eye out, or be sure to come back soon; I’ll update this post with links to the follow-up posts on the subject as and when they are published.